2. Soon after Willie’s death, Mary attempted to communicate with her lost loved ones by engaging the services of a spiritualist medium. She held a séance at the Soldiers’ Home Cottage to try to reach Willie in the afterlife. 3. Mary and Tad often left the Cottage and traveled to New England during the summer and early autumn to enjoy cool temperatures and to visit with Robert, the Lincoln’s eldest son, who was a student at Harvard. 4. 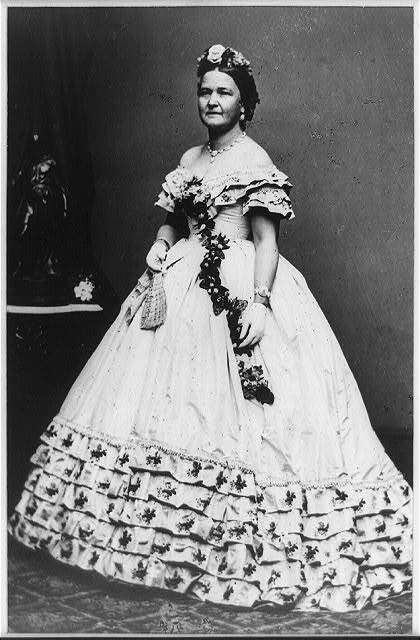 On July 2, 1863, Mary had a carriage accident while traveling between the Cottage and the White House. At first her injuries were thought to be minor, but the wounds soon became infected rendering Mary gravely ill. After initially wiring Robert that his mother was merely “very slightly hurt”, the worsening of her condition prompted a worried Lincoln to summon Robert from Massachusetts to her bedside. 5. In the spring of 1864, Mary embarked on a program to spruce up the Cottage. She purchased wallpaper, linens, and curtains. She also had natural grass matting and cocoa matting–exotic at the time and three times the price of grass matting, though much more durable–installed on the floors, a popular summer alternative to heavy wool carpets. 6. The Lincoln family enjoyed a warm relationship with the “Bucktail” Soldiers, the members of Company K of the Pennsylvania Volunteer Infantry who were assigned to provide residential security for the presidential family. Mary occasionally sent food out to the soldiers who were stationed in tents on the grounds of the Soldiers’ Home. 8. While in residence at the Soldiers’ Home, Mary enjoyed entertaining guests and taking carriage rides with friends. One of her friends was Ellen Stanton, the wife of Edwin Stanton, Lincoln’s Secretary of War. The Stanton family occupied another cottage on the grounds of the Soldiers’ Home during the summer months. 9. On July 12, 1864, Mary accompanied her husband to the battlefront while Confederate troops, under the direction of General Jubal Early, were attacking Washington. Ft. Stevens, one of the fortifications located near the Soldiers’ Home, had come under fire, forcing the Lincoln family to flee to the White House for safety. However, Lincoln, always a very news-hungry and engaged military leader, was anxious to view the battle. On his second visit to see the confrontation at Ft. Stevens, he brought Mary with him. 10. On journeys between the White House and the Cottage at the Soldiers’ Home, Mary and Abraham Lincoln encountered “contrabands” (freed slaves) living in contraband or relief camps. On the occasion of their visits, contrabands would sing to entertain the Lincolns. One woman recounted that Lincoln joined them in song. Ms. Bouterie is a Lead Interpreter and Private and Corporate Events coordinator at President Lincoln’s Cottage. On bullet point number 4 (about the carriage accident), you have the date listed as 1963 when it probably should be 1863. Thank you, Ms. Mason, great catch. We apologize for the obvious typo.